Over the past 50 years, better design and construction have made tractors more powerful and durable. Tractors are the lifeblood of many businesses, and farmers increasingly depend on them to maintain day-to-day productivity. Proper maintenance is critical. Failure to care for a tractor and its parts can mean expensive repairs, as well as forced downtime—a double-dose of bad news. High-quality fluids are an essential part of an effective maintenance regimen. Improper lubrication is one of the leading causes of malfunction and failure in heavy farming equipment. It leaves a tractor’s moving parts susceptible to a number of complications, including wear, corrosion, and compromised performance in extreme temperatures. Using high-quality tractor hydraulic fluid (THF) can help get the most out of agricultural equipment. Quality THFs maximize the performance and life span of a machine, saving money on repairs and helping ensure the best return on your investment. “Being thorough in your tractor’s maintenance means more than maintaining the proper fluid levels,” Hanna says. “It means using the proper fluids.” High-performance THFs contain sophisticated chemical additives that protect a tractor’s system of gears, clutches, and pumps. Premium fluids may cost more, but budget fluids typically lack the additives necessary to protect your equipment’s moving parts. That can translate into more frequent repairs, lost profits, and even replacement costs for damaged equipment. “Neglecting proper maintenance and proper fluids catches up with you sooner or later,” says Hanna. Knowing that most equipment failure is due to improperly lubricated moving parts, you carefully select fluids based on OEM credentials and performance claims. But most OEM specs are self-certifying. That means oil companies can claim that they meet current OEM specifications when, in reality, they don’t. Worse, lubricants that can’t meet valid OEM specs may be misleading by advertising only obsolete and outdated OEM credentials, such as J20A and 303. All this has made it hard to select lubricants you can trust. The TractorLife.com Authenticated mark makes it easy. Fluids endorsed by this mark meet and often exceed OEM credentials, providing tractors optimal protection against wear, rust, oxidation, brake chatter, extreme temperatures, and ultimately, premature equipment failure. The list of brands earning the TractorLife.com Authenticated mark will continue to grow as more products are tested and meet the requirements of the program. For the most up-to-date list of products, click here. High-performance fluids endorsed by the TractorLife.com Authenticated mark protect equipment in ways that low-quality lubricants can’t. 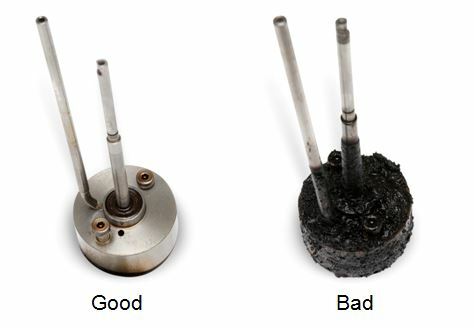 Low-quality fluids cannot prevent oxidation, which is the formation of deposits on parts as well as the thickening of fluids. Deposits and thicker fluids strain hydraulic pump systems, resulting in equipment failure. High performance fluids have oxidation protection and keep parts clean, providing optimal performance throughout the fluid drain interval. High performance lubricants flow well at hot and cold temperatures, providing improved efficiency and pump performance in all weather conditions. 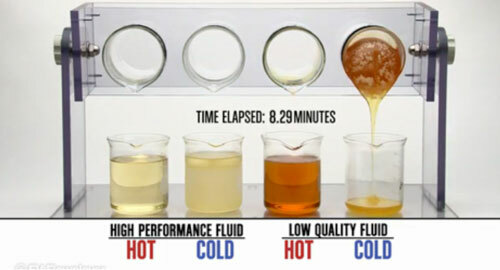 Low quality fluids don’t flow well at cold temperatures. Inconsistent flow makes it harder to start equipment and takes longer to provide a lubricant film in cold weather. Without fluid protection, metal parts grind against each other causing reduced pump output, loss of hydraulic pressure and premature pump failure. This 50-hour test evaluates the lubricant’s load carrying, wear and extreme pressure characteristics in spiral bevel gears. Parts protected by high performance fluid show little to no wear – even after 50 hours. The low quality fluid tested did not measure up – leading to severe wear, ridging and scoring. High performance fluids offer high water tolerance, which allows the fluid to protect parts from erosion and corrosion in the presence of water. This helps optimize tractor performance and reliability. Low quality fluids lack water protection. Water in the oil creates a corrosive mixture, eroding the yellow metal on the hydraulic pump, which results in sluggish tractor performance and even hydraulic pump failure. As a farmer, your tractor is one of your most valuable investments. Keeping it maintained and lubricated with the proper high-quality hydraulic fluid protects the performance of your machine—and the productivity of your farm. For the most up-to-date list of fluids endorsed by the TractorLife.com Authenticated mark, click here.